One of the best forms of imaginative play for kids is to pretend that they are grownups. Anything that they see their parents doing, they naturally want to copy and role play themselves. 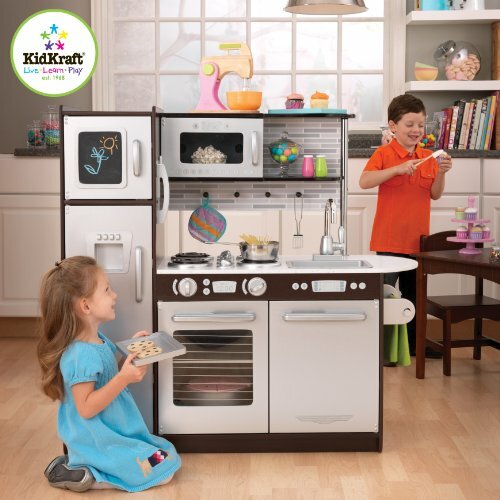 Kitchen playsets for kids are a great toy and activity for role playing games. It’s an activity that the kids see mothers and fathers doing every day and of course they want to be just like you. These great toys are not your typical tea party. Pretend pots and cookware right up to full kitchen ensembles are available. Just add the kids and their imagination and they are good to go for hours of fun. Kitchen playsets are a great toy for in the house or outside in the backyard. They encourage imagination and interactive fun for toddler age and up. 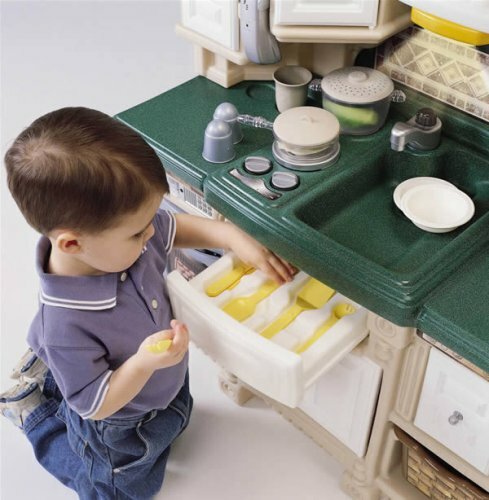 Super durable,stylish and compact kitchen from Little Tikes makes a realistic kitchen playset for kids. It has working doors on the microwave, oven and cabinets. There is even room to store some fake food in the fridge. Accessories include coffee pot, plates, cups, forks, frying pan and even a phone. This little kitchen will keep the kids busy and entertained for hours a day. Set up a kitchen anywhere and get ready to cook with this set of plastic pots, pans and accessories. Suitable toy for kids 3 years and older. Great assortment of different sized pots, pans and utensils for imaginative play. Wow, this realistic kitchen comes with a stainless steel, granite and wood styling. 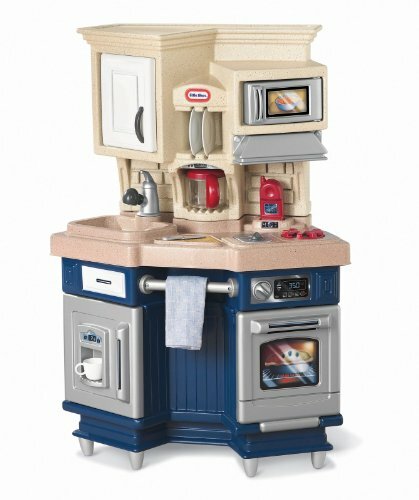 This multiple childs kitchen play area is packed with five realistic electronic features. Microwave, oven , stov top, phone and light. Hours of fun for toddlers 2 years and up. Comes with a 37 piece accessory set including dishes, phone and basket. This is a realistic that even includes a chalkboard surface on the freezer for shopping lists. It is large enough for multiple children to play together and is recommended for three years and up. This is durably built and will last for years and can be passed on to younger siblings. 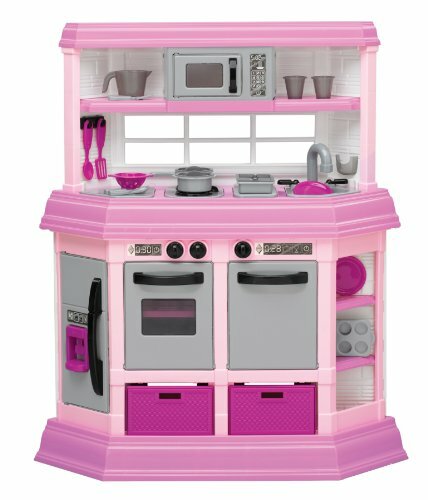 Includes a microwave and dishwasher and 22 play accessories. It has realistic burners with lights and really cool sizzling and bubbling sounds. 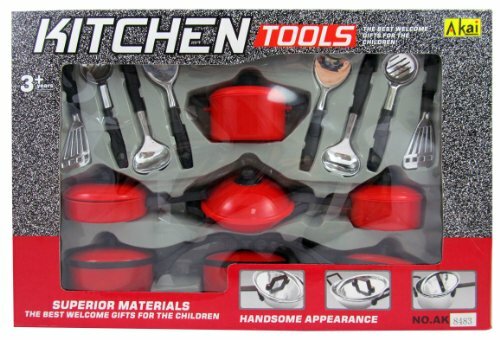 Pots and pans, measuring cups, plates and silverware are all included with this fun toy.